These sneakers had me at Oprah! Well it helps that they are super cute, but allow me to explain. 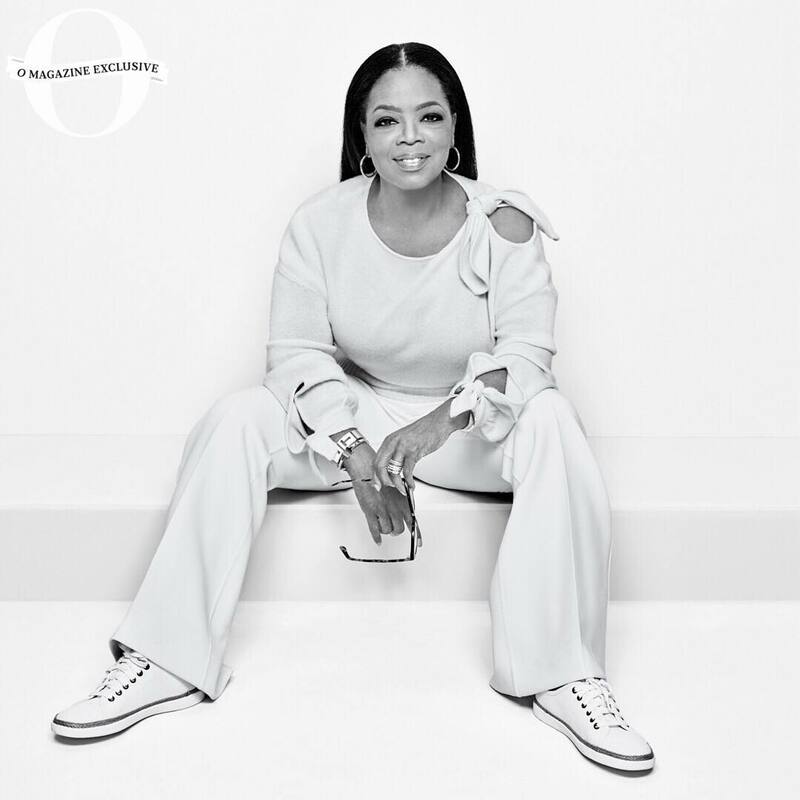 (Read this in Oprah voice) These Vionic Hattie sneakers were featured on my idol Oprah’s feet on the May 2018 cover of O Magazine!!! 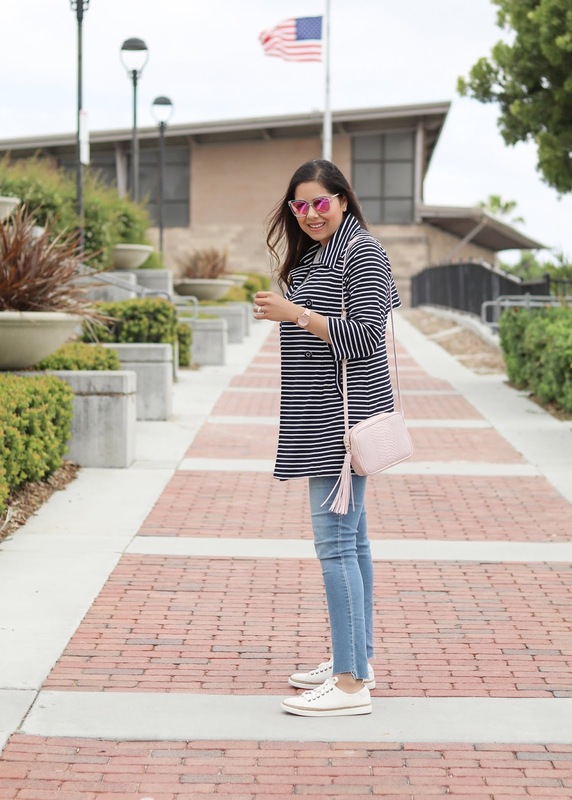 Since I have featured Vionic on my blog before, it made me extra excited to style the same sneakers (#shoetwinsies) for today's blog post. Obvi there will be days were I will toss these sneakers on (especially because they are made with comfort in mind) with jeans and a tee shirt to run errands, buy groceries, etc (ya know all those #adulting and #mommying things?) but how did I take it up a notch and style them in a cute way? 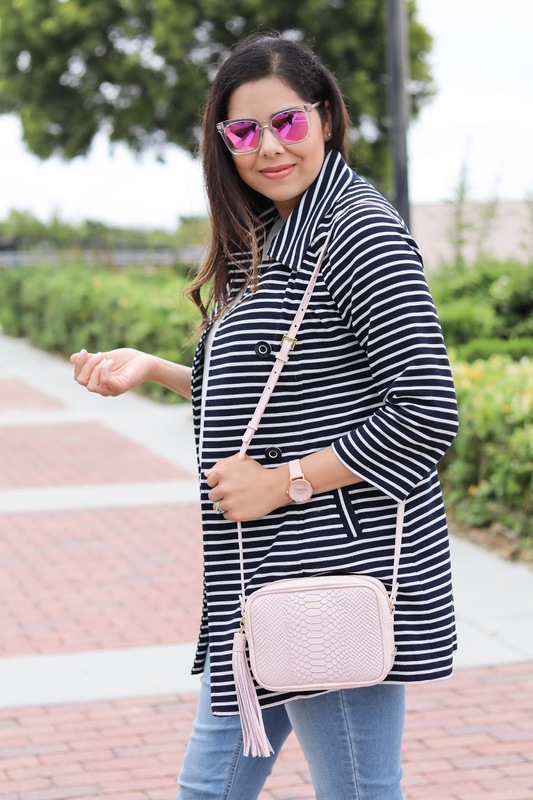 I added a statement coat and some cool accessories to my jean and white top formula! 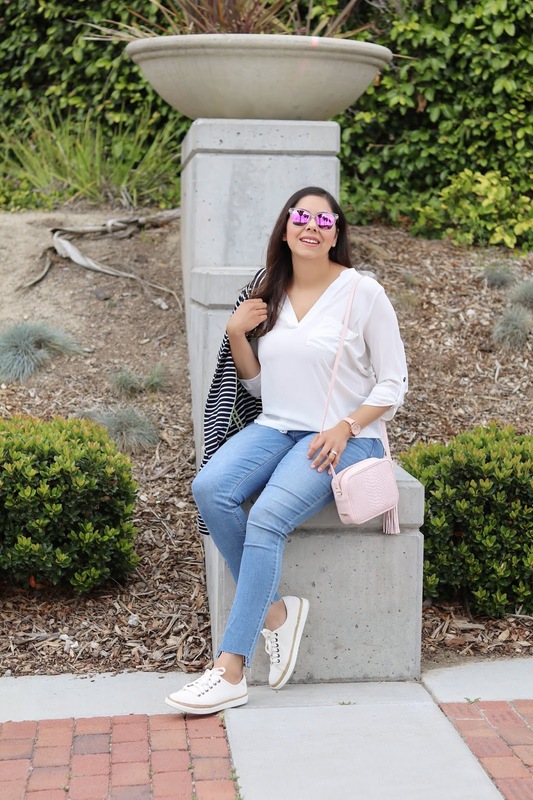 Jeans and a white top have become my blank canvas as of late (if you need a VERY versatile white top, this one is perf!) and since these sneakers are a light cream color they paired well. When I tried it on and looked in the mirror, I kept craving pizzazz so I started combining it with different jackets. 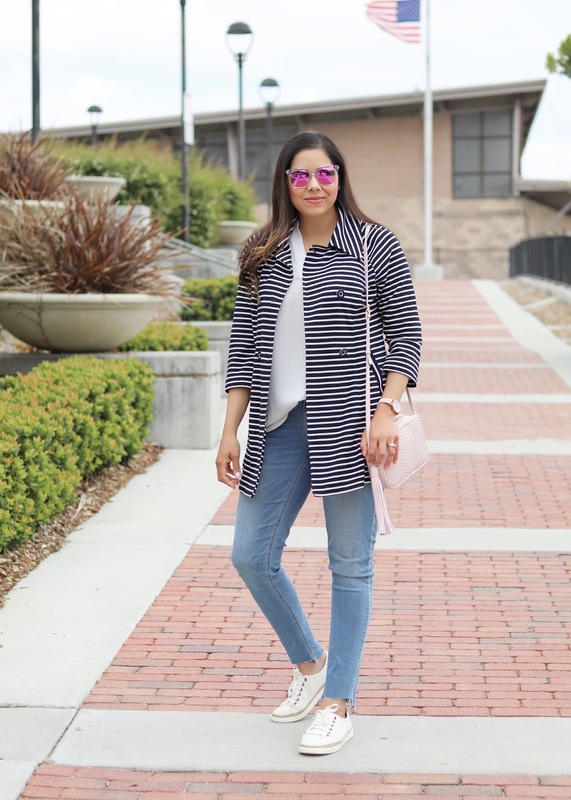 I actually really liked how it looked with many of the moto jackets in my closet, however I landed on this navy blue and white striped trench because it gave it the statement I needed. 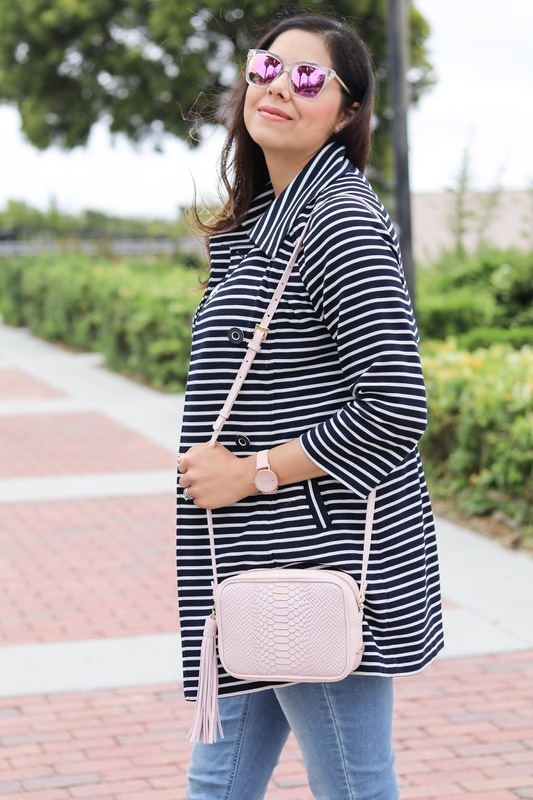 I could have just stopped there for a cleaner look, but since I have been so addicted to light pink accessories lately, I used them for my accent color! 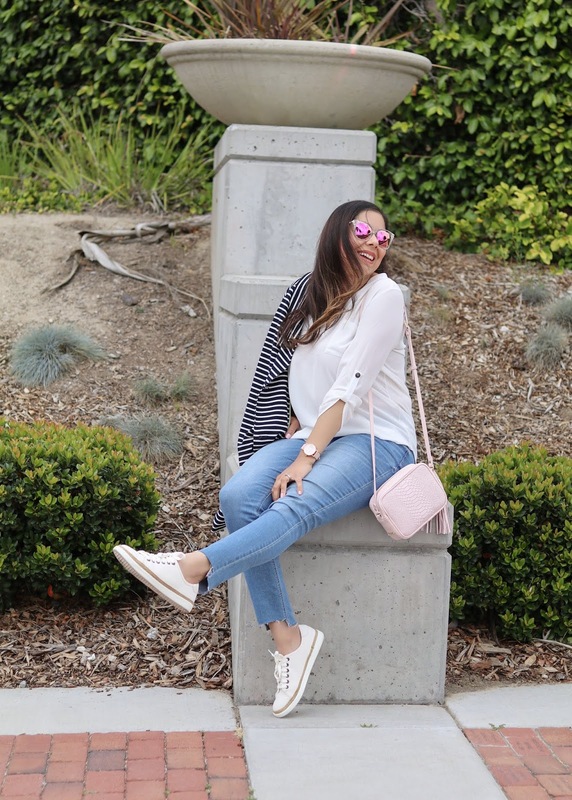 Another thing to note, is that I paired them with my favorite distressed hem skinny jeans to really show off the sneakers (which my sister said I wear too much and need to retire them from the rotation- gotta love sisterly bluntness!) I am planning on popping on a San Diego Padres hat and heading to a game in this outfit! When I do, you'll for sure see it on the 'gram first! And so, in honor of me matching with Oprah, I leave you with my favorite quote from her, my work & blog mantra, "When you do your best, people notice"
The shoes are super cute! And I am in love with that purse. What a gorgeous colour.